Gearhead? Monster truck master? Mechanic? You'll love Titanium-Buzz's collection of rubber-burning tire tread rings. These styles celebrate a love for the open road - the smell of burning fuel, the freedom of an untapped highway - and the adventures that keep your wheels spinning, so they're a top-notch choice for the guy who loves to gun it. Each tire tread ring features a realistic tire tread imprint for an edgy, contemporary feel. We have a team of speed-loving jewelry designers on hand who forge them to achieve that inimitable tire tread texture. These tire treads are totally authentic and are modeled after the wheels of your favorite whips, including NASCAR racecars, off-road vehicles, mud boggers, dirt bikes, drag racers, and more. That's why they make an awesome choice for those speed-loving guys who want to celebrate their mud bogger tires or honor their four-wheeled beast with a Ford or Chevy tire ring. In fact, these rings are so much like their real-life inspirations that we've even partnered up with Goodyear to create a collection of officially-licensed Goodyear tire rings. 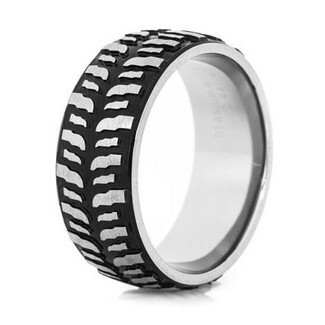 These above-the-cut tire wedding bands are modeled after actual Goodyear tires to ensure that they look and feel accurate to what you'd find on the road. You'll be burning rubber in seconds flat in one of these smashing styles. The only thing that sets them apart from real tires besides their size is that they're made from super-tough metals for a lifetime of wear. Go ahead, kick the tires on our tread rings. These babies are rock-solid. They're made from some of our favorite materials, including titanium, black zirconium, carbon fiber, and cobalt chrome. They're pretty much guaranteed to endure your pavement-pounding lifestyle with jaw-dropping strength built into each one. If you're all about lightweight style, pick up one of our many scratch-resistant titanium tire tread rings or an ultra-lightweight carbon fiber tire ring and get ready to hit the road. For all you grooms-to-be, you'll want to gun it to the altar when you pick up one of our tire wedding rings for your big day. These ultra-contemporary styles celebrate your love for the open road with extra-cool designs that show your unique kind of gear-grinding love. 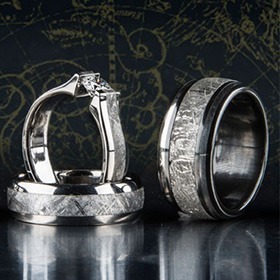 You can take your wedding band up a few notches with one of our sweet gearhead rings, or get ready for a lifelong adventure with one of our motorcycle rings. Whatever you're into, we've got a style for you. 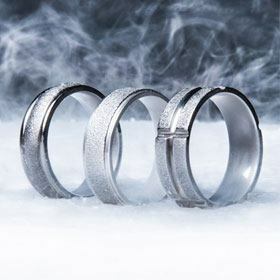 In fact, Titanium-Buzz is pretty much your one-stop shop for all car-related wedding rings. Whether you fancy yourself a dirt-lover looking for mud bogger rings or want to keep it classy with one of these super-sweet tire tread rings, you're guaranteed to meet your match with our selection. Our team is staffed by a bunch of jewelry-making gearheads, so we're always on the lookout for new styles that push the envelope. 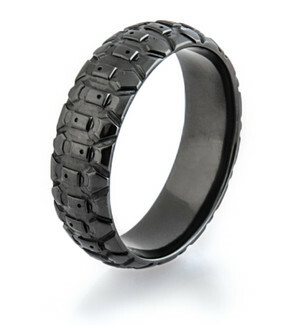 Tire tread wedding rings are a great choice for the speed-loving groom-to-be's big day. Share the love for the open road with your partner by choosing one of our tire tread wedding sets featuring his and her rings. 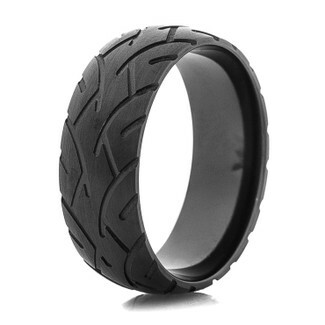 If you're the type of groom who prefers two wheels instead of four, we also carry dirt bike wedding rings for the motocross fanatic. Fancy yourself a speed demon with something to prove? We've got a tire ring that'll speak to your soul. 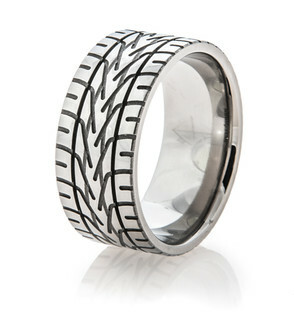 Just take a peek at our Men's Titanium NASCAR Ring - this style is all action, zero talk. It's got a realistic looking NASCAR rain tire pattern all around the sleek, titanium band. In other words, it's a guaranteed win. You can rock this style wherever you go, from the racetrack to a race watch party, thanks to its ultra-enduring and comfortable titanium construction. 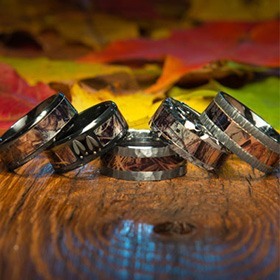 If you're more about the thrill of the mud, you'll find a mud tire ring in our selection that speaks to you. Each one of these styles is precision-carved with a tread imprint that looks just like the wheels on your mud truck. 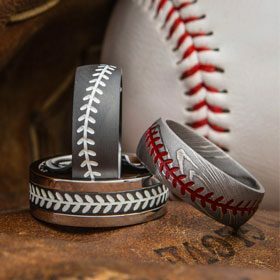 Keep it true to life with a men's black mud bogger ring that looks like real rubber - with much more strength, of course - or choose a statement-making style in titanium or cobalt. The choice is yours. Titanium-Buzz takes the stress out of ring buying with hundreds of unique styles and easy returns. We know it can be daunting to buy rings online, so we make sizing simple, too. We have a large selection of ring sizes to choose from, including 1/4 sizes for select styles. Order your favorite tire tread ring style today to get the best of the road right at your fingertips. Got questions? We've got answers. Give us a call toll-free at 1-866-215-1861 or send us an email and we'll be happy to help you out.